Well, after the Wheel barrow race getting up was a bit of a problem! Not to worry, James was on hand to help Nishi up from the ground after all that excersion. 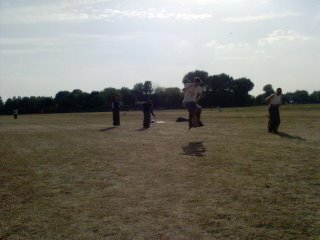 And finally, the sack race. By this point James was close to collapsing – he should have known better than to get one over on Nishi! After all of that excersion, a well deserved drink or three was required to replenish lost fluids after sitting in the sun all day long drinking Pimms and yelling at the teams taking part. Eventually caught the train back to Waterloo, and headed to a tapas bar (yeah! Finally got my tapas!!!) in Waterloo called Meson Don Felipe; http://www.timeout.com/london/restaurants/reviews/6325.html as usual ordered way to much, but it was soooooo delicious! Woke up yet again feeling all hot and sticky from the heat. Am having a quite day to day, putting the washing on, sorting out my Ipod, updating my Blog. If I’m feeling up for it, I may treat myself to a Pizza from my favourite pizza place ‘La Barca’ later on. 1. It’s too damm hot. I can’t be bothered going out. 2. I’m knackered from this week’s activities! 3. Tomorrow I’m going to the Stella Artois Film Festival http://www.studioartois.co.uk/main.html in Greenwich with Teresa & Felicity. So I’m resting today and charging up my batteries for tomorrow. 4. It’s too damm hot! 22 Jul	This entry was published on July 22, 2006 at 3:17 pm and is filed under Personal Blog. Bookmark the permalink. Follow any comments here with the RSS feed for this post. Newer: Back from Greenwich, it’s 1:30am….